A unique and special blend of bright red and white. 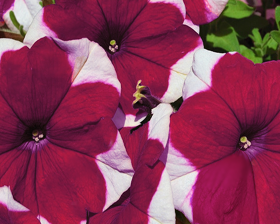 This is a heavy-flowering petunia with large 7 cm blooms that have burgundy centers and white ruffled edges. Plants are bushy and compact at about 25-35 cm high and equal spread. These are very care-free annuals that flower early and will continue to bloom until frost. They make for superb bedding plants in the garden. Grow them as a border or in pots and hanging baskets. Hard to go wrong with these - they look great anywhere!